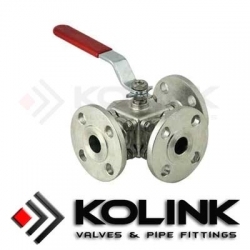 Three-way ball valve have an L- or T-shaped hole through the valve, to create multi-directional medium switch. Moreover, multi-port ball valves such as 4 ways or more, are also available, the inlet way often being orthogonal to the plane of the outlets. For special applications, the operation is performed by rotating a single lever 4-way ball valve. 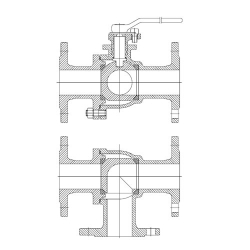 The 4-way valve has two L-shaped ports in the ball that do not interconnect, sometimes referred to as an "×" port.